Director Kim Ji-woon (김지운) is renowned for his genre-play, which perhaps makes it surprising that he waited so long to tackle Korea’s most popular genre – the thriller. As his 8th film, I Saw the Devil (악마를 보았다) is not only a refreshing take on an over-saturated genre but also extends beyond the celluloid in a similar fashion to Michael Haneke’s Funny Games (1997, 2008). Kim Ji-woon understands the genre and its relationship with the audience immensely; that audiences see thrillers to be thrilled. To this end, the auteur not only repeatedly creates incredibly suspenseful scenarios but also indirectly holds audiences accountable for the cruelty and violence that ensues. I Saw the Devil depicts the story of intelligence agent Kim Soo-hyeon (Lee Byeong-Heon (이병헌), whose fiance is brutally murdered by serial killer Jang Keyong-cheol (Choi Min-sik (최민식). Not content with simply finding his finance’s murderer, Soo-hyeon plans to torture Keyong-cheol in the worst way possible – by striking just as the psycho’s bloodlust is about to be fulfilled, severely punishing him, and then setting him free. In this way Keyong-chul’s punishment, and Soo-hyeon’s vengeance, will be never-ending…but in doing so, Soo-hyeon must walk the dangerous line between man and monster. Choi Min-sik and Lee Byeong-Heon are, as one would expect from such acting powerhouses, fantastic in their roles as serial killer and intelligence agent. While the roles don’t exactly stretch the actors into new territory, they convey incredible intensity throughout their cat-and-mouse games. Choi Min-sik in particular appears to relish his turn as sadistic serial killer Jang Keyong-cheol as he snarls and cackles without remorse as his victims suffer atrocities. His sheer intensity during such perverse sequences makes for uncomfortable but compelling viewing, and even provides some darkly comedic sensibilities in the horrific and ironic situations that arise. Lee Byeong-Heon is also terrific as he searches for revenge. The evolution of his character from agent to monster is riveting, as his moral code dissipates and allows further crimes to be committed in his selfish and arrogant desire for extreme vengeance. Kim Ji-woon has achieved ‘auteur’ status for a very good reason, and actually manages to extend himself further through incorporating audience ‘pleasures’ and accountability. When the film begins, the camera is within a van driving along rustic country lanes in the snow. Either side of the rear-view mirror are florescent blue ‘wings’ that connote eyes; audiences are thus placed within the mind of a ‘monster’ as it prowls the countryside for its next victim. This is a recurring feature, as Kim Ji-woon aligns audiences with the villain making them responsible for their own voyeuristic desires of violence and mayhem. Yet once intelligence agent Soo-hyeon has caught the monster, the auteur splits alignment between the excitement of Keyong-cheol as he obtains his next victim, and the thrills of Soo-hyeon as he violently halts the killer. 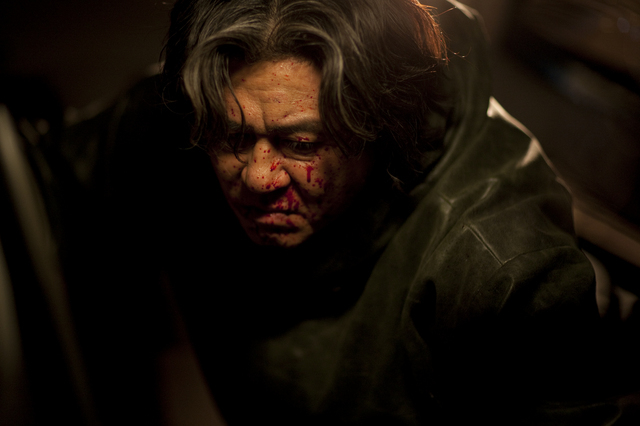 Kim Ji-woon understands his audience intimately and makes the cat and mouse game, in a sense, the audience chasing themselves as they simultaneously enjoy the murderous thrill of catching the prey and the (violent) catharsis of the saviour-figure that stops the perversity before the degradation has gone beyond acceptable limitations. He then punishes the audience for their desires within the narrative structure, forcing them to face their own notions of ‘pleasure’ within the cinema. Mirror image – who is the monster? I Saw the Devil is a wonderful addition to an over-saturated genre, and offers a fresh and interesting take on the notions of revenge by implicating audiences within the frantically-paced violence that transpires. As such, the protagonists lack depth and the events that transpire do little to provide evolution, but the film is not intended as a character study. Rather, it’s about the nature of violence and retribution, its escalation, and the accountability of the audience in their desires for such cruelty.